I have to pack up my classroom. Time is running low, and summer is in sight. How do I take all of the bright and cheery decorations down, and still motivate my students to keep working hard on these last few days? How do I give myself enough time to thoughtfully pack things up with intention? This was the first time I have done a classroom transformation, and the first time I tore down my classroom before the students left for the summer. I certainly do not regret either decision. It was a great experience for the kiddos and myself! I hope you will stick with me, while I share the physical classroom transformation and activities that made this last week of school a complete success! If you have done a classroom transformation, I would love for you to share how it went in the comments below. I quickly decided on doing a beach theme for the last week. Typically we take all students in grades K-6 to a local State Park to go swimming. This year, sadly, there were not enough life guards available, so we couldn't go. The beach theme was supposed to lead into us going to the beach, but instead it worked as a substitute for it all together. Sad, but not a bad alternative. After I decided on doing a beach theme during the last week, I started to sketch a plan in my mind. What did I want the room to look like? What will I need to execute? Below is a picture of my shopping/planning list. Click below to open a file (shared in GoogleDoc). You will want to download the file and open the PDF to have editable capabilities. 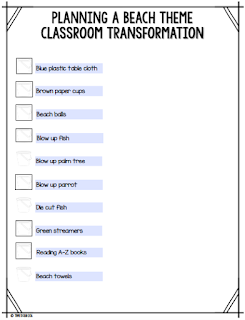 One file is an editable PDF for you to start your planning. The other file, when available, I linked up the the materials I used to execute my makeover. I continue to work with students up until the last full week of school, so the week before I really started to gather my goodies. I went shopping, started planning the academic activities, and got creative. Before redecorating my classroom, I used my school's die cut machine to cut out paper fish and shells. I gathered some left over brown construction paper and assembled a sandcastle. I also brought in my amazing beach chair (I can't say that I didn't sit in it throughout the last week of school to type final reports). On the second to last Friday right after the final bell, I took down my bulletin boards, other decorations and anchor charts. That took some time, but I just piled it all on my desk. Then, I was able to staple the table cloths, tape the fish and seaweed and hang the blow up fish from the ceiling. CLASSROOM TRANSFORMED, in under 20 minutes and for less than $20.00! My classroom could not look like this for two weeks! Instead we had fun learning at the beach! I work with struggling readers and writers in grades 1-4, so these activities were differentiated to meet the complexity of the group. On Monday, we read passages from ReadWorks.org. We discussed the text using the beach balls from the dollar store, which I wrote general comprehension/discussion questions on. These questions could be used for any text, so I'll definitely be saving them for next year. These beach balls encouraged good discussion and great laughs! Who was a character in the story? What important events happened in the story? When and where did the story take place? Would you recommend this story to a friend? Why? What did you already know about this topic, that helped you understand this text better? What is a new vocabulary word you learned? What does it mean? How do you know? Does this text have text features? Name one (or two). What are three facts you learned? On Tuesday, we got in some opinion writing. I asked students if they would rather play in the water or on the beach. They had to support their opinion with two-three reasons. Then they shared their opinions with the group. With my older students, I sketched a quick graph of their choices, and when writing their final piece, they had to say if they agreed or disagreed with the majority. You can grab this activity by clicking HERE. Party City. I wrote sight words on the cups, and they tried to build the biggest sand castle by reading all the words correctly. They also practiced writing rhyming CVC words in sand. As part of our daily routine, my students write in rice tubs, so this sand was just the switch up they needed. My 2nd-4th grade students were all about the sea! They conducted mini research about a sea animal of their choice. They used National Geographic Kids to find out more about their animal. I found this idea on Pinterest, here. On Thursday, we kicked up our feet, I turned on some sounds of the beach, and we READ! Throughout the week before, I searched Reading A-Z for any book that was related to water, beach, summer, ocean, pirates, etc. The previous school I worked at had a subscription to Reading A-Z, but my current school does not (this year! ), so I signed up for the FREE two week trial. You do get a limited number of downloads, but it is a pretty significant number. I printed off every "beachy" book I could find within my students' reading levels. A laid the books out and just let my students read at the beach. It is very possible that this was their favorite day of the week. They were even exchanging books, and independently sharing why they liked the book they were giving to their friend! WHAT? Who are these kids? Friday was our field day, so I didn't need to plan this day. 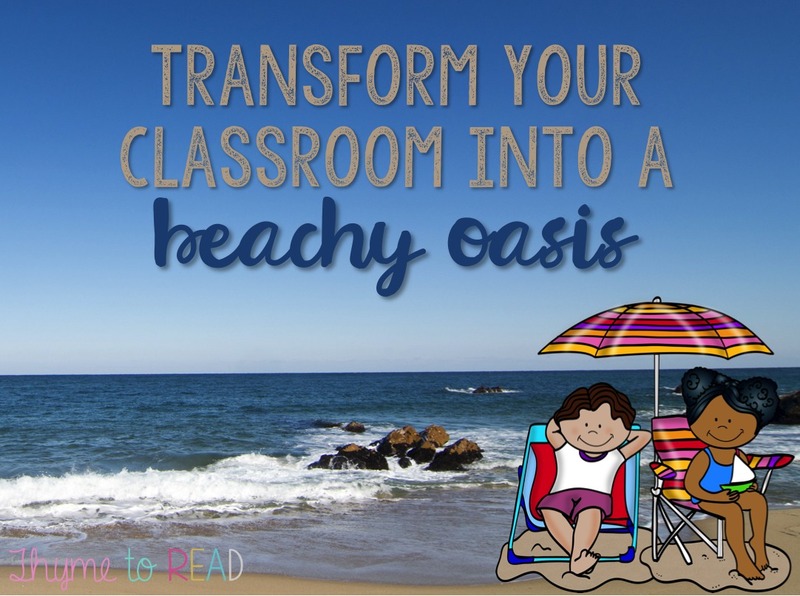 But, if you are looking for more ideas to help you plan a beach themed week, I have linked to my beachy Pinterest board HERE. 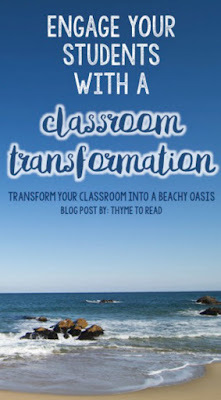 It is already filled with some beachy ideas and I am always pinning more. So again, why did I decide to redecorate my room with only a few days left? It was a way to reinvigorate and motivate the kiddos to keep working through the last days of school. Each day they took a ride on ChristensenAIR, complete with flight attendant speech - they loved it! Then they ASKED to read! Believe it or not, with just three half days left, they asked if they were coming to the beach this week. So, yes, it was motivating for the kids, but selfishly I got to pack exactly the way I wanted/needed to. I'm a little ashamed to admit that my husband and I moved 3 times in just about three years before we bought out first house. In all those moves, I learned a few things. The biggest was pack what you don't need first. Well in my classroom, I need the pens, post-its, scissors, etc. I don't NEED my bulletin board and anchor charts. So with the limited time I have to actually pack stuff up, they just needed to go. Rather than chaotically shove things in cabinets or closets - I neatly rolled my anchor charts - I put smaller posters in labeled folders - I even found new homes for other supplies in my room that will allow me to get RID of my teacher desk in the fall and make room for more student spaces! If you ask me if I would do this again, my answer would be "ABSOLUTELY!" I loved the airplane ride. We just got to relax and read, it was the BEST! Mrs. Christensen put fish in the sky. She let us read whatever we wanted. Please do this again next year! Now if that isn't the type of reaction every teacher wants their students to have, especially during the last week of the year, I don't know what is. Doing a classroom transformation was not only easy, it was incredible motivating for my students. 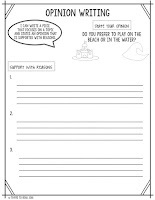 I will definitely be looking for ways to incorporate this kind of engagement throughout the year! If you have any questions, please reach out, I would love to collaborate with you.